(2532, John E. Shanafelt Collection, OHS). (19687.TO.G113.43.3.7, Chester R. Cowen Collection, OHS). Before the development of civic clubs in the early twentieth century in the United States, fraternal orders such as the Ancient, Free and Accepted Masons (AF&AM) and the Independent Order of Odd Fellows (IOOF), having their origin in Europe, existed in America. By the 1730s Freemasonry was established in the United States. Membership grew following the Revolutionary War but declined in the 1820s and 1830s during the Anti-Masonic Movement. In 1819 Thomas Wildey organized the first IOOF lodge in Baltimore, Maryland. Other societies proliferated during the Progressive Era, with an estimated six hundred organizations and five million members. Among the nation's numerous fraternal orders, the Masons, the Odd Fellows, and the Knights of Pythias have enjoyed the largest membership. Fraternal orders are generally defined as groups "whose members are usually bound by oath and who make extensive use of secret ritual in the conduct of their meetings." Some groups have initiation of new members, offer different levels of achievement within the organization, and have secret gestures and handshakes. Typically, membership is limited to one gender, usually men, with women forming auxiliary groups. Through the years individuals have joined fraternal organizations for various reasons. Some were joiners, but others sought various benefits. Members in fraternal orders enjoyed an early form of networking that allowed businessmen to afford each other's services. Some organizations offered social outlets for like-minded people, but other groups provided mutual aid or charity to members as well as nonmembers. Ethnic fraternities gave immigrants an opportunity to preserve their culture and to have access to insurance and economic assistance. For example, the Italians in Krebs, Oklahoma, formed the Cristoforo Colombo (Christopher Columbus) Society, a mutual aid club that provided insurance and sick benefits to its unmarried working men who had no family nearby. Czechs living in Prague, Oklahoma, formed the Cesko-Slovansky Podporujici Spolek (CSPS or Czech-Slavic Benevolent Society) Lodge Number 214. In 1897 those members disbanded the CSPS lodge and reunited as a Zapadni Cesko-Bratrska Jednota (ZCBJ or Western Bohemian Fraternal Association) lodge. Two other early ZCBJ lodges were organized, in Perry in 1898 and in Yukon in 1899. 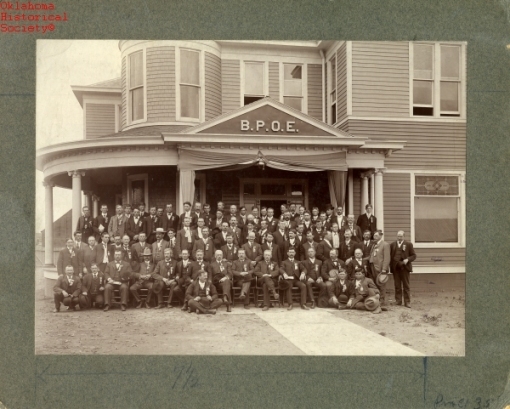 The CSPS and ZCBJ societies were formed to provide life insurance for its men members. As the population moved west, individuals established organizations that they had joined in their former places of residence. Following removal from the southeastern part of the United States to Indian Territory (I.T. ), members of the Five Tribes formed Masonic lodges. Many prominent American Indian leaders in I.T. were Masons. Among them were Peter Pitchlynn, John Jumper, John and William P. Ross, and Opothleyaholo. Before the Civil War five lodges existed in I.T. On November 7, 1848, the Grand Lodge of Arkansas granted a charter to the Cherokee Lodge Number 21 (the first lodge in I.T.) at Tahlequah, the Cherokee Nation capital. Between 1850 and 1855 units formed at Fort Gibson, Doaksville, Flint (present Stilwell), and at the Creek Agency (northwest of Muskogee). During the Civil War these disbanded, and the charters were revoked. Thus, Freemasonry ceased to exist in I.T. until 1868. In 1868 Rev. Joseph S. Murrow, known as "the Father of Masonry" in Oklahoma, was instrumental in organizing Oklahoma Lodge Number One at Boggy Depot, Choctaw Nation (Choctaw Gov. Allen Wright suggested the lodge name). Other lodges were chartered at Doaksville, Caddo, Flint, Fort Gibson, and the Creek Agency. In October 1874 the Grand Lodge of Indian Territory was established, and Indian Territory lodges no longer fell under the jurisdiction of Arkansas. Granville McPherson was elected first grand master. Women had an auxiliary, known as the Order of the Eastern Star, which organized in the United States in 1876. On February 25, 1879, Murrow formed the O-Ho-Yo-Hom-Ma Chapter, the first Eastern Star chapter at Atoka, I.T. He helped set up eight others and the Grand Chapter of the Order of the Eastern Star of the Indian Territory in 1889. After the Land Run of 1889 Masonic lodges formed in the Oklahoma Territory in Oklahoma City, Edmond, Guthrie, Kingfisher, Norman, and Purcell. The Anadarko Masonic lodge, established in 1884 prior to any land openings, is possibly the oldest in the western half of Oklahoma. The Grand Lodge of Oklahoma Territory formed in November 1892. In 1909, two years after statehood, the separate grand lodges of the two territories joined as the Grand Lodge of the State of Oklahoma. 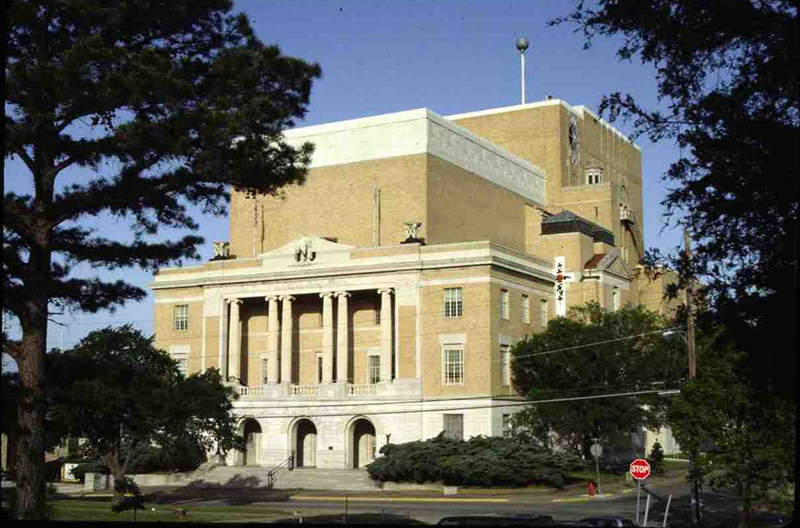 Scottish Rite consistories are located in McAlester, Tulsa, and Guthrie, with Guthrie serving as home to the grand lodge. 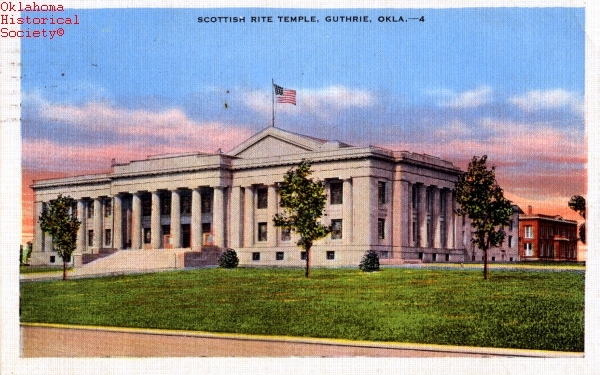 The Scottish Rite Temple in Guthrie and the McAlester Scottish Rite Temple are listed in the National Register of Historic Places (NR 87000503 and 80004521, respectively). The first Masonic Children's Home was established on December 31, 1907, in Atoka. From 1908 to 1910 the facility housed eighty-five children and ten adults. In 1910 the Grand Lodge bought the American Indian school at Darlington near El Reno and moved residents there from Atoka. However, the place was too isolated for children. Consequently, in September 1922 the residents moved from El Reno to Guthrie to the State House (Convention Hall) until the new Masonic Home was completed in October 1923. Four years later a separate home for the elderly was built. It continued to operate into the 1990s. The Masonic Children's Home was closed in 1977. Oklahoma has the distinction of establishing a girl's auxiliary called the International Order of the Rainbow for Girls (IORG), founded by Rev. William Mark Sexson on April 6, 1922, in McAlester. Sexson believed that there should be an organization for girls because the Order of De Molay for boys had been founded in 1919 in Kansas City, Missouri. As a thirty-third degree Mason he wrote the first ritual and the laws governing the girls' order. The Supreme Temple for the IORG was built in McAlester in 1951. From a charter class of 171, Rainbows grew to international scope. At the turn of the twenty-first century the International Order of the Rainbow for Girls had assemblies in forty-six states and eight foreign countries. The first IOOF lodges in present Oklahoma were instituted on May 8, 1875, at Caddo, Choctaw Nation, I.T., and on October 23, 1875, at Tishomingo, Chickasaw Nation, I.T. Caddo Lodge Number One, with six charter members, was organized by Ben F. Christian, of Sherman, Texas. On August 3, 1893, in Lehigh, I.T., seventeen lodges formed the Grand Lodge of Indian Territory, and John Rennie of Lehigh was installed as grand master. In 1898 there were fifty-eight Odd Fellows lodges. On November 16, 1889, seven months after the Land Run of 1889, an organizational meeting of the IOOF was held in Norman, Oklahoma Territory. Other lodges soon formed in the newly established towns. On April 26, 1893, twelve subordinate lodges created the Grand Lodge of Oklahoma Territory. On April 13, 1911, the Grand Lodge of Indian Territory and the Grand Lodge of Oklahoma Territory were consolidated as the Grand Lodge of Oklahoma of Independent Order of Odd Fellows. At that time all lodges were renumbered and rechartered. In 1911 there were approximately thirty thousand members in Oklahoma. Judge James Brooks Ayers Robertson, a future governor of Oklahoma, was elected grand sire of the national IOOF in September 1915. Daughters of Rebekah, the IOOF's women's auxiliary, was founded in South Bend, Indiana, in 1851. The first Rebekah assembly in present Oklahoma was organized at McAlester, I.T., in 1886. With more than fifteen thousand members in Oklahoma and Indian territories, the Rebekah assemblies also consolidated in 1911 to form the Grand Lodge of Oklahoma Daughters of Rebekah. The Oklahoma Rebekahs grew from nineteen assemblies in 1898 to 207 in 1971. The state IOOF and Rebekahs sponsored two homes: in 1901 a home for orphans and elderly was constructed on a 153-acre farm near Checotah in I.T. On April 26, 1907, a home for orphans, situated on a 160-acre farm at Carmen, O.T., was dedicated. In 2001 the Oklahoma Odd Fellows Home at Checotah was added to the National Register of Historic Places (NR 01000660). Since the founding of the Fraternal Order of Knights of Pythias by Justus H. Rathbone and government clerks in 1864 in Washington, D.C., membership and goals have expanded. With a primary objective of promoting friendship and benevolence, Pythians had three lodges and seven-eight members in 1864. By 1889 there were 2,724 lodges and 263,847 members. The Knights of Pythias were organized by John I. Dille in Oklahoma City, Oklahoma Territory, on November 18, 1889, with thirty-three charter members. Soon other lodges were initiated in recently established towns in O.T. Pythians also organized in Indian Territory, and five lodges formed a grand lodge in 1889. With statehood imminent, the grand lodges of the territories joined in the creation of the Oklahoma grand lodge at a meeting held in Shawnee in May 1907. In 1910 the state had 153 lodges, compared to 7,895 nationally. Prominent Oklahomans who have been Pythians included Wesley E. Disney, Thomas P. Gore, and Ernest W. McFarland. The women's auxiliary, known as the Pythian Sisters, first organized in 1888 in Warsaw, Indiana. Although Oklahoma chapters of Pythian Sisters existed by 1907, no date is known for the establishment of the first chapter. At the turn of the twenty-first century membership in fraternal orders had declined due to other attractions. Since the heyday of civic clubs and fraternal organizations, various forms of entertainment, sports, and other types of clubs have occupied Americans' leisure hours. Membership in Oklahoma Masonic lodges peaked in 1958 with eighty-six thousand members. By 1991 membership had dwindled to half that number. In 2001 the IOOF statewide membership stood at thirty-six hundred compared to a high of fifty thousand in 1940. Alan Axelrod, The International Encyclopedia of Secret Societies and Fraternal Orders (New York: Facts on File, Inc., 1997). Lynn Dumenil, Freemasonry and American Culture, 1880–1930 (Princeton, N.J.: Princeton University Press, 1984). Grand Chapter Order of the Eastern Star of the State of Oklahoma, comp., The Legend of Oklahoma, O.E.S. : The Story of the Order of the Eastern Star in the Indian Territory, Oklahoma Territory and the State of Oklahoma (N.p. : N.p., 1952). History of Free Masonry in Oklahoma (Muskogee, Okla.: Muskogee Print Shop, 1935). Jasper Ridley, The Freemasons: A History of the World's Most Powerful Secret Society (New York: Arcade Publishing, 2001). Albert C. Stevens, comp. and ed., The Cyclopaedia of Fraternities (1907; reprint, Detroit, Mich.: Gale Research Co., 1966). Linda D. Wilson, "Fraternal Orders," The Encyclopedia of Oklahoma History and Culture, https://www.okhistory.org/publications/enc/entry.php?entry=FR007.